The only way that CC Sabathia wasn't going to opt out of his contract — as he had a right to do until midnight last night — was if he was able to negotiate a new deal to his liking with the Yankees first. And so last night, with just hours to spare before Sabathia had to decide whether he was going to rip up his existing contract and become a free agent, Sabathia did indeed reach an agreement that will keep him in New York until at least 2016. It's a deal that makes sense for Sabathia — he's now the highest-paid pitcher in baseball, in terms of average annual salary — but it also makes sense for the Yankees, as far as these things go. 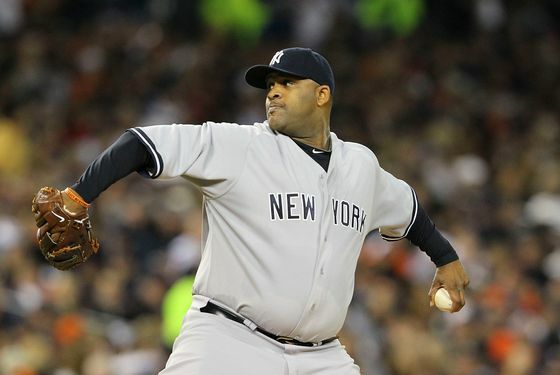 Sabathia will be paid $25 million in 2016, which is the final year of the new contract, the source said. The deal contains a vesting option for $25 million in 2017 with a $5-million buyout solely on the condition of his shoulder since the Yankees have some concern about a pre-condition. Sabathia, who also retains a hotel suite on trips, a no-trade provision and the right to buy tickets, will qualify for the vesting option as long as he spends less than 45 days on the disabled list with a shoulder injury in 2016. That's a lot of money, of course, but let's be honest: The Yankees have money. What they were likely wary of, however, was adding too many years to the package. Sabathia, after all, was in a position to ask for both a raise and a longer contract. And so considering they were reportedly prepared to give Cliff Lee a seven-year contract last year, they couldn't have expected Sabathia to take much less than what he did. Lee might be the better pitcher right now, but Sabathia is also two years younger. The option becomes guaranteed if Sabathia does not finish the 2016 season on the disabled list because of a left shoulder injury, does not spend more than 45 days of 2016 on the DL with a left shoulder injury or does not make six or more relief appearances in 2016 because of shoulder problems. It's not total protection — if Sabathia injures something other than his shoulder, it wouldn't prevent the option from kicking in — but it's at least something. And though the Yankees have reason to want to protect themselves towards the end of this contract, they must also be well aware of how badly they need Sabathia right now. Their rotation already has quite a few question marks; they couldn't afford to lose their ace, as well. And so they made a lucrative offer before other teams could get involved: Perhaps no other team could have offered that much money, or would have been willing to give him even more years, but it wasn't worth the risk to find out. Sabathia, via ESPN, said he wanted to make sure he ended his career as a Yankee, and that hopefully, this contract will allow him to do so. If that vesting option kicks in, he'll be 37 when it ends. That's still a long contract for a 31-year-old pitcher, to be sure, but it's unlikely the Yankees could have offered him a much shorter one and still kept him from opting out.